I have been toying with the idea of buying PSP for a couple of weeks and have been lurking on the forum. My 2003 model has just arrived and I would like to install custom firmware on it. Have seen a couple of threads on similar topics but wanted to ask questions first so I won't brick my PSP. Am I correct that newer CFWs allow to play newer games like Disgaea 2 and Tactic Ogre? extract both and place in the psp file directory ms0:/PSP/GAME. First, run ONLY the cfw installer. And then run the psp_ident. 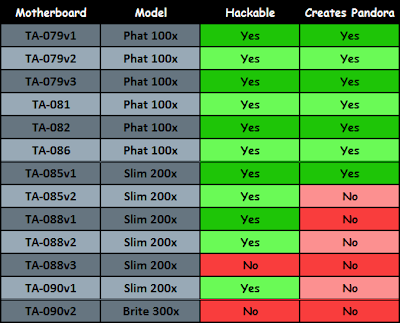 IT will now show you your mobo model and you can refer to this image if your psp is hackable or not. If it does say it's hackable, continue on and run the cipl_flasher and you're all good to go. Thank you Faustnero. I am on system software 4.05 so upgrade is in order. Will do that tomorrow if my memory stick arrives. Just one question regarding 6_60 pro ident, at the linked site there are 4 versions of B10 version, all dated October 2011. Should I grab them all or just the top one? just the top one that says '6.60 pro-b10'. sorry I though I put the link to the file. Here's a forum thread that describes the differences between the two custom firmware packages. are there any noticeable differences between pro b-10 and 6.60me? Thanks for the info DarkED. What is the difference between PRO-B and PRO-C FW and what does the patch for PRO_C do? Eh, nooby me, I have installed the update and extracted both psp_ident and 6.60 PRO-B10 packs into the GAME folder but on my PSP 3 files are being shown as corrupted data. There is an icon for psp_ident but when I try to start it I get an error saying the file is corrupt.